I’ve certainly been advised in recent months to take care of myself – or I won’t be able to take care of anyone else. We hear it inflight – if there is an event where oxygen masks drop, put your own mask on first, before that of your children. When you think about it – it makes sense. Yet sometimes are own inherent reactions to sudden or ongoing stress seems to surface. So if we think this through – being the best version of yourself will certainly impact your abilities and value to your job and the company you work for. But those aren’t always there. We lose jobs, quit jobs, our jobs get eliminated, or we just can’t find a job. But we – you and me, are always going to be here. There are so many experiences and knowledge gained in one work environment that we don’t always think about how this translate into our own worth in the next job – what we subconsciously take with us. Consider a thorough self exam – an honest one. Am I eating a proper diet to maintain health and energy and ward aging culprits? Can I be more organized at home – thereby alleviating unnecessary stresses? Do I have a place at home to go relax, unwind, meditate when needed? What is a fear that I should be able to conquer on my own? Am I continually late and need to organize my schedule, planning, etc.? Am I looking forward to things, or always looking back? Maybe these items and more, are on your personal to-do list but they never seem to get checked off. Being the best version of yourself is a gift only you can give yourself. The items above are just food for thought. Checking them off one at a time is better than never getting to that list. Self-help books, peer groups, classes and other activities may help you get there, but you need to take that first step on you own. 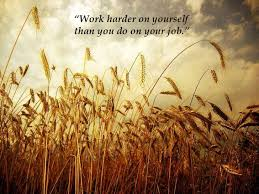 We all work so very hard and dedicate our time, energy and often emotion to our work; yet taking little time for our own self-improvement. Here are just a few people that have worked quite hard on themselves, with forever learning and continuous improvement in many aspects of their lives… all contributing to their success as great leaders of our time. Categories: Career Transition | Tags: adaptability, hillary clinton, jim rohn, personal development, robin sharma, seth godin, steve jobs, take care of yourself, tony robbins | Permalink. 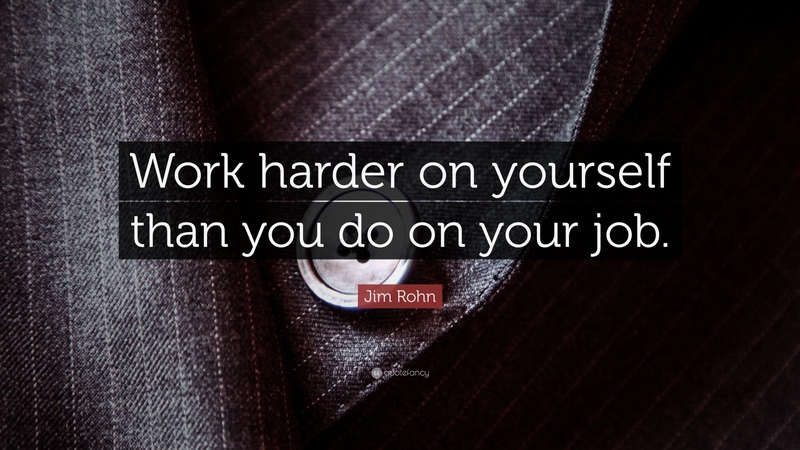 ~ Jim Rohn (1930-2009) was an American entrepreneur, author, business philosopher and motivational speaker. His rags to riches story played a large part in his work, which influenced others in the personal development industry. We often talk about both professional and personal development when coaching one-on-one or in small groups. Many of us can gain professional development through our employers – if indeed employed, and if the employer provides such. However, it is quite refreshing to meet those who seek personal and/or professional development on their own. In part, because it is at their own expense and likely something they have invested in for their own growth. And outside of your chosen field – there are other things to learn, and in the long run – it keeps our brains more active and less prone to aging in more ways than one. It’s the longer term unemployed that concerns me. How does one stay connected and involved in their industry when they’ve been removed from it for a long period of time, voluntarily or otherwise? In the event one wants to explore an entire new career path, how are they learning about it on their own time. There are those that do get lucky; never having to truly pound the pavement to get a new job. Those are the ones often recruited from one company to another, without a break in between. This occurs for different reasons: a former boss goes to a new company and eventually wants to invite former colleagues or staffers to join him/her. On other occasions – people do make a name for themselves which could be due to very public roles, or customers, etc. but also because that name goes along with a good reputation. And there’s just dumb luck. How about going to confession and being hired while still in the dark?! Yes, it has happened and we will be sharing that story soon in our ‘careers interrupted’ pages. In any case, whether you are a behind the scenes worker or on the front lines dealing face-to-face with customers/clients/vendors – having some additional knowledge and expertise in your back pocket is a good thing. There are many ways to think outside the box regarding professional development and do so on your own – like taking online classes, subscribing to trade publications, get involved in groups or volunteer efforts of an organization that interests you. Maybe within your current organization – find out if there is a way you can be mentored by someone, or at least work on projects with people from other departments. Examples and experience that comes to mind: a few years ago, a client of mine had signed on for SAP. SAP is a multi-national company that makes enterprise software to manage business and customer relations with more than 291k customers. Let that speak for itself. For this transition, employees from across the organization were either hand-picked or asked to be a part of the transition and implementation of SAP company wide. It was approximately a 2 year process if I remember correctly – but the experience gained was priceless, as was the new relationships that developed during this long-term project and very likely – a more mutual respect for each others’ work and contribution. My own experience to share was when employed with in the airline industry. I was fortunate to be a part of some significant changes over time: being part of the transition team to transfer and test all data when converting to a new airline reservation system; being part of the implementation and training of a new baggage handling program that allowed me to travel to other airports to help train. This was just a couple of things I was able to participate in and grow from. Once you show up – and shine – you just might get invited to participate in other projects as well and continue to make a name for yourself, and build your reputation. When it comes to personal development, that is on you! Self-funded and self-interest. Unemployed for more than a year? Well, what a great time that could have been to learn a new language – in between networking and applying for jobs. Certainly a good conversation to be had in any setting. What about reading the books (personal or business related) that you always wanted to read? What about taking a class, in something you’ve never tried before. There are all kinds of opportunities – at low-cost and sometimes no cost. There are writing classes and groups. Classes in martial arts, or the arts in general. Learn an instrument. Especially when out of work for more time than you anticipated – something new to learn and think about, and place in your routine, can be motivating on its own. How else might you explain what you’ve accomplished the past year or so while not working? Gardening? Well, there are classes and workshops for that. Taking care of an aging or dying parent? I’ve heard that one before. Sad but true. Well, I’ve been there, done that, and still doing so. But I’ve learned a great deal of information and has opened my eyes to careers I had not explored, or recruited for, and maybe some new opportunities may be around the corner simply because I took the time to learn and research something I had not chosen to learn – but it chose me. Timing is everything, or so I’ve heard. Categories: Career Transition | Tags: jim rohn, learning new when unemployed, personal development, professional development, work hard on yourself | Permalink.